Everest Refrigeration was founded as a foodservice equipment manufacturer based on the principle of continual improvement and dedication to providing the best commercial refrigeration in the industry. Their U.S. distribution facility in Carson, California provides equipment manufactured in their South Korea factory. With an ever-expanding product line, Everest continues to innovate and offers equipment designed to be reliable and durable. Everest Refrigeration ESC47L 47-1/4" Left Compressor Curved Glass Refrigerated Sushi Case - 1.5 Cu. Ft.
Everest Refrigeration EBB23G 23-1/2" Black One Section Glass Door Back Bar Cooler - 8 Cu. Ft.
Everest Refrigeration EMSGR69C 72-7/8" White Three Swing Glass Door Chromatography Refrigerator - 71 Cu. Ft.
Everest Refrigeration EBSR2 49-5/8" Two Section Solid Door Upright Reach-In Refrigerator - 48 Cu. Ft.
Everest Refrigeration EBF2 54-1/8" Two Section Solid Door Upright Reach-In Freezer - 50 Cu. Ft.
Everest Refrigeration EBF3 74-3/4" Three Section Solid Door Upright Reach-In Freezer - 71 Cu. Ft.
Everest Refrigeration ESR1 29-1/4" One Section Solid Door Upright Reach-In Refrigerator - 23 Cu. Ft.
Everest Refrigeration ESC47R 47-1/4" Right Compressor Curved Glass Refrigerated Sushi Case - 1.5 Cu. Ft.
Everest Refrigeration ESC59L 59" Left Compressor Curved Glass Refrigerated Sushi Case - 2 Cu. 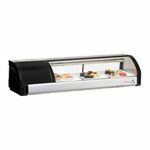 Ft.
Everest Refrigeration ESC59R 59" Right Compressor Curved Glass Refrigerated Sushi Case - 2 Cu. Ft.
Everest Refrigeration ESC71R 71" Right Compressor Curved Glass Refrigerated Sushi Case - 2.5 Cu. Ft.
Everest Refrigeration EBB48 49" Black Two Section Solid Door Back Bar Cooler - 14 Cu. Ft.
Everest Refrigeration EBB59 57-3/4" Black Two Section Solid Door Back Bar Cooler - 20 Cu. Ft.
Everest Refrigeration EBB69 68" Black Two Section Solid Door Back Bar Cooler - 24 Cu. 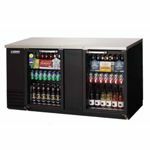 Ft.
Everest Refrigeration EBB90 89-1/4" Black Three Section Solid Door Back Bar Cooler - 32 Cu. Ft.